Paris TV Centre acquires new DSNG. 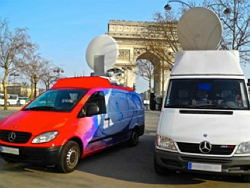 Paris, March 2014: Paris TV Centre, the major broadcast services provider in Paris since 1997, has acquired a new DSNG station permanently dedicated to news requirements in the Paris area. The vehicle, based on a Mercedes Vito, is equipped with two redundant paths and a radio camera for a maximum flexibility and rapidity of deployment. At the same time, PTC has re-equipped its Mercedes Sprinter DSNG with new ATEME MPEG4 encoders for top quality contribution. PTC is ideally located at the foot of the Arc de Triomphe with studios, chroma-key and live positions using the Arc as background. Complete shooting, editing and transmission packages are available with experienced multi-lingual staff. The unparalleled transmission services include 6 fiber optic connections and dedicated high-speed FTP transfers. John Cressey, PTC Managing Director: "We are continuing to invest in the operational tools and development projects in Paris. With the second SNG we will be better able to provide news coverage while improving our HD contribution services. The investments show our willingness to stay in the forefront of technological developments with SNG services with both HF and fiber links to reply to client demands. In the current depressed economic context and in face of aggressive competition, we feel it’s important to stay on top of the market with improved services and strong investment in the future." PTC, has a strong permanent staff and more than 30 freelancers collaborating on a regular basis and they serve the most prestigious news channels and broadcasters throughout the world.